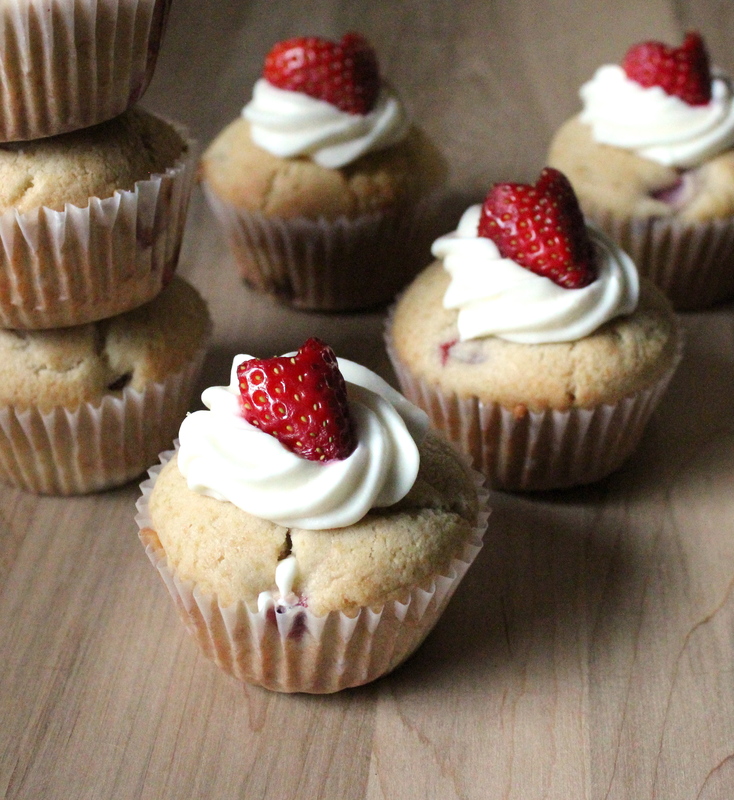 Happiness Project #33: Strawberry Cream Cheese Muffins! Firstly, finely chop or slice up the strawberries (after removing their green heads) and gently toss them in your reserved 3-4 tablespoons of granulated sugar. Otherwise, they will taste somewhat wet & slimy within the actual baked muffin. Set aside. Preheat your oven to 350F. Fill up two cupcake pans with paper baking liners. In a separate large bowl, whisk together the flour and baking powder until well mixed. Set aside. In a bowl on your stand mixer, cream together the butter and 1-1/4 cups sugar until smooth and fluffy. Add all 3 eggs, plus the egg white, and vanilla extract and beat until well combined. After dropping your mixture speed to a lower setting, slowing add in the flour mixture to the butter mixture, alternating with the 1 cup of whole milk, always starting with and ending with the flour mixture. Once gently but fully combined, grab a spatula and mix in the chopped & sugar tossed strawberries. Using a large spoon, scoop strawberry batter into each paper liner, filling to the top edges. Pop the two pans into the oven and bake for 22-25 minutes, until the muffin top edges are a very light golden brown. Let cool on a wire rack, while you’re preparing the cream cheese spread. In a large, clean bowl on a stand mixture (or by hand held) cream together the butter and cream cheese until nicely blended and smooth. To avoid any clumping, scrap down the sides of the bowl with a spatula. Drop your mixer to a slower speed and add in the 2-3 cups powdered sugar, mixing until well combined. For a silkier texture, add in up to 2 tablespoons of whole milk. Spread or frost your strawberries to your hearts contentment! Or if you’re not keen on cream cheese, you can also sift some powdered sugar onto each muffin instead! Bam! Fruity Muffin Happiness! For everyone! « Happiness Project #32: Chocolate Orange Pound Cake! Such a lovely muffin recipe! Cream cheese always makes everything taste better! Happiness is a nice, warm, Strawberry cream cheese muffin! Thanks. Love this!! It’s amazing what inspires us in the kitchen! Hope your little one is feeling better and gobbling these muffins up!